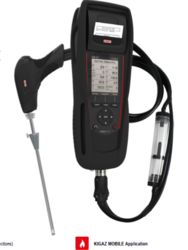 We are prominent manufacturer and supplier of Combustion Gas Analyzers. These are highly appreciated by our clients, Client satisfaction is our main motive, keeping this in mind we deliver international quality product to our valuable clients. These are available at reasonable price. 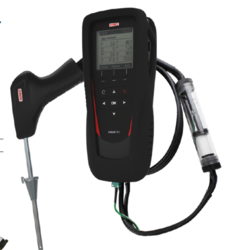 Built-in printer Intuitive interface due to icons LED on the probe handle to light dark areas Single connector Interchangeable probe 2 Go memory (100 000 measurements) Step by step procedure menu (gas flow, inspections)FEATURES OF THE INSTRUMENTGAS - Autozero in the flue- CO sensor protection bysolenoid valveFlue gas CO and ambientCO maxInterchangeable sensors: O2 long lifeand CO-H2 and NO and CH4 (optional)Excess airLossesEfficiency > 100%PRESSURE Differential pressuremeasurementDraft measurementTEMPERATURE Ambient temperature Flue gas temperature Delta Temperature DHW temperature2 thermocouplesDew pointtemperatureOTHERFUNCTIONS15 programmed combustibles1 Adding 5 combustibles bythe userOpacity indexCOMBUSTION GAS ANALYSERKIGAZ 210CO-H2, NO and CH4interchangeable sensorsCO sensor protection bysolenoid valveO2 long life sensor1Combustibles: Sahara/Fos-sur-Mer Natural Gas, Groningen Natural Gas, Russia/North Sea Natural Gas, Propane, LPG, Butane, Light Oil, Heavy Oil, Bituminous coal, Hard coal, Coke gas, Bio fuel 5 %,Wood 20 %, Wood-chip 21 %, Pellet 8 %Auto-zeroing in the flueKIGAZ MOBILE ApplicationMEASURING RANGEParameter Sensor Measuring range Resolution Accuracy*T90 responsetimeLong life O2 Electro-chemical From 0 % to 21 % 0.1 % vol. ±0.2 % vol. 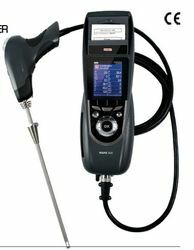 30 sCO(with H2 compensation) Electro-chemical From 0 to 8000 ppm 1 ppmFrom 0 to 200 ppm: ±10 ppmFrom 201 to 2000 ppm: ±5% of measured valueFrom 2001 to 8000 ppm: ±10% of measured value30 sNO Electro-chemical From 0 to 5000 ppm 1 ppm From 0 to 100 ppm: ±5 ppm.From 101 to 5000 ppm: ±5% of measured value 30 sLow range NO Electrochemical From 0 to 500 ppm 0.1 ppm From 0 to 100 ppm: ±2 ppmFrom 101 to 500 ppm: ±2 % of the measured value 30 sNOx Calculated** From 0 to 5155 ppm 1 ppm - -CO2 Calculated** From 0 to 99 % vol 0.1 % vol - -CH4 SemiconductorFrom 0 to 10000 ppmFrom 0 to 1 % VolFrom 0 to 20 %LEL1 ppm0.0001 % Vol0.002 %LEL±20 % of full scale 40 sFlue gas temperature K thermocouple From -100 to +1250 °C 0.1 °C ±0.4 % of measured value or ±1.1 °C 45 sAmbient temperature Internal NTC From -20 to +120 °C 0.1 °C ±0.5 °CAmbient temperature Pt100 (1/3 DINexternal probe) From -50 to +250 °C 0.1 °C ±0.3 % of measured value ±0.25 °C 30 sDew pointtemperature Calculated** From 0 to +99 °Ctd 0.1 °C - -DHW temperature TcK (external probe) From -200 to +1300 °C 0.1 °C ±0.4 % of measured value or ±1.1 °C -Differential pressurePiezoelectricFrom -20 000to +20 000 Pa 1 Pa From -20 000 to -751 Pa: ±0.5 % of measured value ±4.5 PaFrom 750 to -61 Pa: ±0.9% of measured value ±1.5 PaFrom -60 to 60 Pa: ±2 PaFrom 61 to 750 Pa: ±0.9% of measured value ±1.5 PaFrom 751 to 20 000 Pa: ±0.5% of measured value ±4.5 Pa-Draft From -10 to +10 PaFrom -1000 to +1000 Pa0.1 Pa1 PaLosses Calculated** From 0 to 100% 0.1% - -Flue gas velocity Calculated** From 0 to 99.9 m/s 0.1 m/s - -Excess air (λ) Calculated** From 1 to 9.99 0.01 - -Efficiency (ηs) Calculated** From 0 to 100 % 0.1 % - -Efficiency (ηt)(condensation) Calculated** From 0 to 120 % 0.1 % - -Opacity index External instrument From 0 to 9 - -*All accuracies indicated in this document were stated in laboratory conditions and can be guaranteed for measurements carried out in the same conditions, or carried out with required compensation. **Calculation is made based on the measured values by the analyzer. 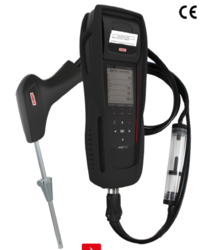 MEASURING RANGEParameter Sensor Measuring range Resolution Accuracy* T90 response timeO2 Electro-chemical From 0 % to 21 % 0.1 % vol. ±0.2 % vol. 30 sCO(with H2 compensation) Electro-chemical From 0 to 8000 ppm 1 ppmFrom 0 to 200 ppm: ±10 ppmFrom 201 to 2000 ppm: ±5% of measured valueFrom 2001 to 8000 ppm: ±10% of measured value30 sFlue gas temperature K thermocouple From -100 to +1250 °C 0.1 °C ±0.4% of measured value or ±1.1 °C 45 sAmbient temperature Internal NTC From -20 to +120 °C 0.1 °C ±0.5 °C -Ambient temperature Pt100 (external probe1/3 DIN) From -50 to +250 °C 0.1 °C ±0.3% of measured value or ±0.25 °C 30 sDew-point temperature Calculated** From 0 to +99 °Ctd 0.1 °C - -DHW temperature TcK (external probe) From -200 to +1300 °C 0.1 °C ±0.4% of measured value or ±1.1 °C -Differential pressureSemiconductorFrom -20 000 to+20 000 Pa 1 Pa From -20 000 to -751 Pa: ±0.5 % of measured value ±4.5 PaFrom -750 to -61 Pa: ±0.9 % of measured value ±1.5 PaFrom -60 to 60 Pa: ±2 PaFrom 61 to 750 Pa: ±0.9 % of measured value ±1.5 PaFrom 751 to 20 000 Pa: ±0.5 % of measured value + 4.5 PaDraft From -10 to +10 Pa -From -1000 to +1000 Pa0.1 Pa1 PaLosses Calculated** From 0 to 100 % 0.1 % - -Excess air (λ) Calculated** From 1 to 9.99 0.01 - -Lower efficiency (ηs) Calculated** From 0 to 100 % 0.1 % - -Higher efficiency (ηt)(condensing) Calculated** From 0 to 120 % 0.1 % - -Opacity index External instrument From 0 to 9 - - -*All accuracies indicated in this document were stated in laboratory conditions and can be guaranteed for measurements carried out in the same conditions, or carried out with required compensation. **Calculation is made based on the measured values by the analyser. 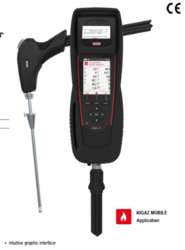 Looking for Combustion Gas Analyzers ?